A huge "Thank You" is extended to Gene and Barbara Schaltenbrand for offering to host the 71st SOS reunion. It is not an easy job to coordinate such an event, but they succeeded with ease. The time-of-year, location, and accommodations at the Four Points-Sheraton Hotel, Ft. Walton Beach, FL were very satisfactory. Reunion members were so pleased with the location and accommodations at Ft. Walton Beach, and decided to hold the next reunion in two years at the same location. The exact dates have not been confirmed, but likely will be the second weekend in March, 2003. Additionally, it was proposed and decided to also hold a reunion in 2002 at Columbus, Indiana, home location of the 71st. Many members felt it important to have reunions more frequently than every two years due to the age of many members. The second location will make it easier for 71st members to travel to one or the other location. More details will forthcoming as they unfold. The special guest speaker at the Saturday evening dinner was U. S. Air Force Captain Justin Caroll. 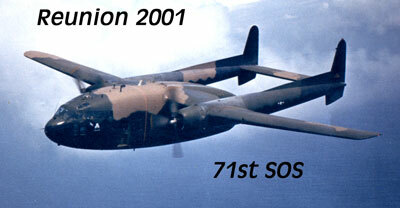 Captain Caroll is assigned to the 4th SOS as an Electronics Warfare Officer (EWO) on the AC-130U gunship. Justin made a very interesting presentation about state-of-the-art gunship technology, and some of the missions and assignments he has completed. One of the other nice offerings for reunion attendees was a guided tour of an AC-130U gunship at Hurlburt Field. Members were amazed at the tremendous advances in gunship technology since the formative years of the AC-47 and AC-119 of the 60s. The Tiki Hut at the hotel was a gathering place for swapping stories and reviewing many photos, newspaper clippings, and documents pertaining to the 71st. Members should be encouraged to bring more items to the next reunion to share with others. 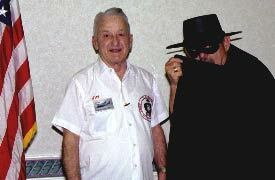 The Shadow reunion would not have been complete without the appearance of a special "invited" guest. Jim Pyle and The man who knows what evil lurks beneath the jungle canopy. Continue with more Shadow Reunion 2001 coverage by viewing the following links.